There are many concepts in science where different sets of evidence seem to lead to contradictory conclusions, or where the evidence leaves crucial holes in the narrative. In my experience, many lay people notice these contradictions or holes, but often assume that they simply don’t understand the concept, that it’s just them. Or, worse, they assume that science is arrogantly asserting something that they perceive makes no sense, purposely evading a problem with the concept, and so often they end up doubting that science, particularly if it contradicts some cherished notion. Ironically, if you talk to most scientists, they are completely honest about what these unknowns are, often emphasizing them. But somehow these “we don’t know” statements don’t always get explicitly stated in articles and shows. I think most scientists and even scientifically literate people often are so used to the idea that these are unknowns, that they forget that it’s not obvious to many people learning them for the first time. So, here are some examples I’ve come across in conversations, online or in person. Why did the big bang…bang? How can anyone just assert that the universe just banged into existence out of nothing? The answer of course, is that no one knows how the universe just banged into existence. There are tons of evidence that the observable universe started expanding around 14 billion years ago from a hot dense infinitesimal point, but nothing definite on what caused that initial hot dense point, or why it started expanding. Scientists are just as curious as everyone else about what this reason might be. There are lots of speculative theories (eternal inflation, quantum fluctuations, etc), but nothing firm yet. How can light or matter be both a wave and a particle? No one knows. There’s solid experimental evidence for light being particles (photons) and solid experimental evidence for light being waves. And there’s evidence that this duality applies to all elementary particles, atoms, and even isolated molecules. 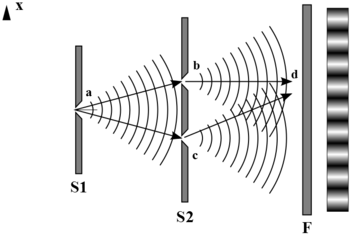 Bizarrely, the double slit experiment shows waves until you add some way to figure out which slit the photons go through, then it shows particles, as if the act of being observed changes the reality. People have been speculating about what exactly this means for decades. This is actually one that got me for a long time. I recall learning about wave / particle duality in grade school, but wondering how it could make sense. None of the textbooks, teachers, or anyone else said, “Yes, this is freaky weird and no one knows why it is so.” If they had, I think they would have saved me long term confusion. How did life start from non-life? You can probably guess the answer by now. The fossil evidence shows life progressing from early simple microscopic organisms, but it doesn’t show how life began. There are lots of speculative theories, but none have evidence. In principal, all evolution would need is some kind of self replicating molecule to get started, but no one knows how that self replicating molecule came about, or even if that’s all life was initially. Dark matter and dark energy are just scientist making stuff up. Actually, those names are just labels for ignorance. Think of them as placeholders to label phenomena that are not understood yet. 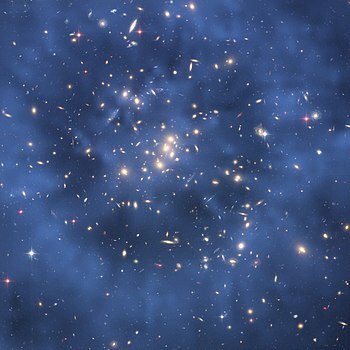 Dark matter is evidenced by the formation and rotational speeds of galaxies, as well as the lensing of light caused by its gravitational effect. But no one has managed to actually detect this matter yet. It’s only known by its gravitational effects. (I’ve often wondered if a better name might not have been “mystery mass”.) Again, lots of theories, but no evidence yet. Dark energy is simply a label for the unknown cause of the accelerating expansion of the universe. An acceleration that is overcoming the force of gravity, and no one knows why, except that it must be some form of energy, hence the “dark” part of the name. Yep, that’s right. We don’t know what energy is, at least aside from it being something that causes things to happen. Nick Lucid gives a pretty good summation of the situation with energy. The list is, of course, endless. Science progresses by making observations, performing experiments, and then trying to explain what those observations and experimental results mean. Sometimes the explanations are bizarre, not because scientists like bizarre explanations (well some do), but because it’s the explanations that best fit the evidence. If an explanation seems bizarre to you, it probably does to scientists too, but the thing to remember is that scientific theories, at least established ones, have a lot of evidence backing them up, even when everyone, left, right, and center, find them freakishly weird. If there were no unknowns, science would not progress. Reports in popular media generally focus on knowns (facts) and in particular on progress (news). 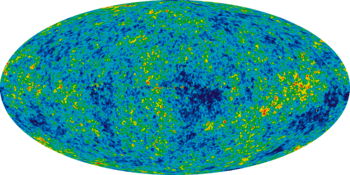 “Still no explanation for the Big Bang – scientists to blame” is not a headline that you should expect to find anytime soon. I don’t doubt it. But it would be nice when writing introductions about what the big bang is, to spend maybe one sentence saying, “Oh BTW, scientists don’t yet know what caused it.” I think that bit of honesty changes the impression, for many lay people, from a crazy sales pitch of a nonsensical notion, to one of a profound mystery. Our ignorance has the same value as our knowledge… and our knowledge is only property of our mind. It is probably very helpful in our development and our existence. But our knowledge is only an image of the universe and not its essence. As one would expect, being part of something bigger, there is any real hope to have a reasonable idea of ​​the whole universe. Being a part of this universe we do not see its essence but are subject to its influence so we have only his picture in our mind, so, only, a math universe. but i could be wrong! On math universe, have you heard of Max Tegmark’s book, ‘Our Mathematical Universe’? I’m currently reading it. You might find it interesting. Unfortunately, for me, here in Poland… not available (small town, periphery of the world, price). But if what you’re reading is interesting, i’m sure that soon the main your thoughts appear on blog. One of the most important opportunities for the development of my mind lies in the fact that i have the opportunity to meet interesting people… like You, Steve, and even Michelle! Very much agreed. I’m old enough to still marvel at how amazing it is now for people around the world to casually communicate. And how easy it is now to find information. Yes. Me too. It’s amazing to be able to have these discussions. . Very nice post. It is a point I make often to teenagers, that their school will tell them that we know everything, thus making many topics utterly boring, when in fact what is fascinating is how little we know. I once mentioned to my son, who was (miraculously) doing some homework on mass, that nobody knows what mass is. He later brought this up in the physics lesson, and was told off for being a smart alec. This is teaching at its worst. He suggested to me that there should be a period every week devoted to what we don’t know, because this would inspire the pupils to take an interest in many otherwise deeply dull subjects. .
My physics teacher at school told us that mass is “the amount of stuff in an object” and refused to discuss it any further. At university I learned that there are two kinds of mass – inertial and gravitational – and Einstein’s genius was in realising that the two are equivalent and consequently inventing the General Theory of Relativity. Now physicists know that mass is generated by the Higgs field, but I still don’t know what it is, and I don’t think anyone really does. Answering this question will be necessary to create a Grand Unified Theory.